For the indecisive fast food fan, it's the ultimate in convenience. 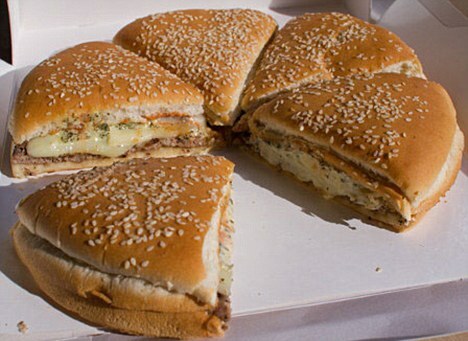 A 'pizza-burger' has been launched by Burger King for the days when you just can't make up your mind which takeaway to have. But with the number of calories it packs you may as well go ahead and just eat a burger followed by a pizza - because the nine-and-a-half-inch monstrosity contains 2,500 of them. That's more than a whole day's recommended calories for the average woman. Made with four Whopper beef patties topped with pepperoni, mozzarella cheese, marinara sauce, and Tuscan pesto sauce, it comes cut into six slices, like a pizza. It also contains 144g of fat and 3,780mg of sodium. The takeaway option will be available exclusively at Burger King's Times Square Whopper Bar in New York, from September, costing $13 ( £8.40). And if the pizza-burger doesn't float your boat, the Times Square outlet also offers another exclusive - the Meat Beast Whopper, featuring beef, bacon, pepperoni, American cheese and mayonnaise. Think I'll stick to the doner kebab pizza. Nothing like a large fish finger sandwich to satisfy. Looks a bit dry to me. A side of mayo or coleslaw would be handy.